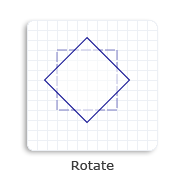 Creates a rotation transformation that has the specified angle and center point. The rotation angle in degrees. A positive angle creates a clockwise rotation, and a negative angle creates a counterclockwise rotation. The point about which the rotation is performed. When calling this method, specify a centerPoint to rotate the object about, and the rotation angle in degrees. The following illustration shows a square rotated 45 degrees about its center point. The following example uses the D2D1::Matrix3x2F::Rotation method to create a rotation matrix that rotates a square clockwise 45 degrees about the center of the square and passes the matrix to the SetTransform method of the render target (m_pRenderTarget). The following illustration shows the effect of applying the preceding rotation transformation to the square. The original square is a dotted outline, and the rotated square is a solid outline. // Apply the rotation transform to the render target. // Draw the transformed rectangle. Code has been omitted from this example. For more information about transforms, see the Transforms Overview.